↑ "स्टालिन की बेटी और भारत". बीबीसी. 29 नवम्बर 2011. ↑ "Land of Opportunity", TIME 26 मई 1967. ↑ Nikita Khrushchev (1990). Kruschev Remembers. पृ॰ 220. आई॰ऍस॰बी॰ऍन॰ 0-316-47297-2. ↑ Montefiore, Simon Sebag (2003). Stalin, The Court of the Red Tsar. पपृ॰ 1–38, 90. आई॰ऍस॰बी॰ऍन॰ 1-84212-726-8. ↑ "Obituary: Dinesh Singh". The Independent. 2 दिसम्बर 1995. ↑ Lukas, J. Anthony (March 20, 1967). "Stalin's Daughter Called Indian Village a Paradise". New York Times. ↑ "एक थी स्वेतलाना". लाइव हिंदुस्तान. November 30, 2011. ↑ Scott Bauer. 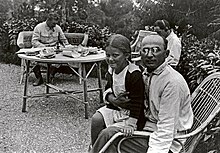 "Stalin's daughter Lana Peters dies at 85". News.yahoo.com. AP. अभिगमन तिथि 29 नवम्बर 2011. ↑ "जोसफ स्टालिन की बेटी स्वेतलाना भारत की बहू भी थी". वन इंडिया न्यूज़. November 30, 2011. ↑ "स्वेतलाना का भारत से था भावनात्मक रिश्ता". खास खबर. Alliluyeva, Svetlana; Priscilla Johnson (translator) (1967). Twenty Letters to a Friend. London: Hutchinson. Alliluyeva, Svetlana; Paul Chavchavadze (translator) (1969). Only One Year. Harper & Row. आई॰ऍस॰बी॰ऍन॰ 0-06-010102-4. Alliluyeva, Svetlana (1984). Faraway Music. India.